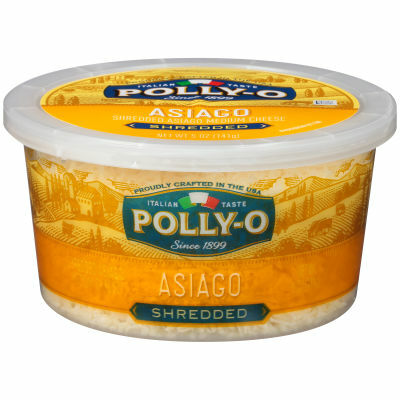 Classic Italian Shredded Asiago Cheese Polly-O Shredded Asiago is made with premium quality natural ingredients to add some real cheesy goodness to your everyday meals. This cheese is delicately prepared using classic Italian techniques with such excellence that you will be able to taste the tradition and heritage of Italian cheese-making in every blissful bite. More Cheese is Always Better Transform your regular meals into indulgent culinary experiences with this shredded Asiago cheese. Add it to your salads, sandwiches, pasta, and casseroles or just pile it up on your pizzas for a little added cheesiness. You are bound to drool over its classic flavor and gooey, smooth texture. This tub contains 5 oz of shredded cheese.